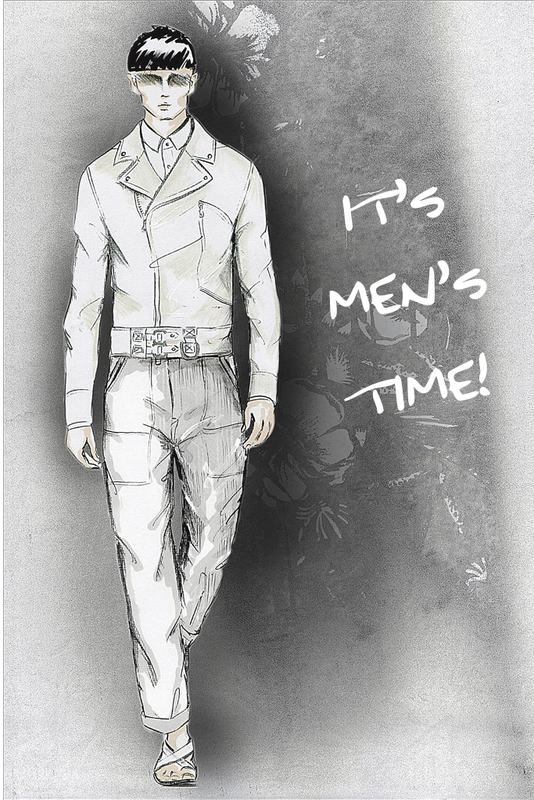 About two weeks ago began to be released Spring 2014 RTW collections for men. Consecutive weeks after being released Resort 2014 collections (collections being female) The truth is that over the last few years the fashion for men has taken every times larger proportions. Men give more importance to their appearance, and women also increasingly giving more importance to the appearance of men. What I think is great. Gone are the days when only women had to walk “to the nines” and men could look like cavemen and everything was fine. Today there are so many trends for men as for women, and in some cases the trends are quite similar. Wear shorts above the knee is already “allowed” to men without that look weird. Such as wearing sandals, in a male version. Can use bags, and various other accessories! Honestly, I think the process until the men are so “fashionistas” as women was a very slow process. I think this happened because many were afraid to wear certain clothes or colors and look less masculine. Regardless of their sexual orientation. After all there was a preconceived idea that men had to look like men, and if they use an accessory, would look ridiculous. In my opinion, a genuine stupidity! While in women’s fashion, more masculine pieces are a real hit, it has been seen in menswear pieces more feminine, more delicate. With bright colors, floral patterns. And as much as it may seem wrong for guys to wear more feminine pieces for men who know how to use are fantastic. Finally the legacy of dark colors, too sober and bland finished. Men have become more interesting “visually”. I know that this expression was quite futile and sexist, but true. There are women who follow trends so strictly that they all seemed to join an assembly line, I think the couple of years ago it was the same with men. Were almost equal. There were always exceptions to the rule, once you could see as a man that stood out all the crowd, someone bolder, but overall fashion for men was boring, maybe I’m wrong, but that’s how I saw it. In my view, and I think the perspective of almost all women, I think this “transformation”, fantastic. Especially because men can be more free in their choices in relationship to fashion. Can be more audacious. More confident in theirs image and like women, can show theirs personality through wearing. In all age groups, social status, sexual orientation, and in almost all religions or cultures. But one day we will get there. At least I hope so. Especially because at least for me fashion is not only futile, superfluous. Or not at all. Fashion is another option that we can take in our life. To show who we are. So we can feel better with us. Well fashion is a passion. And finally, most men today have the ability to admit and show that fashion is also something that they love. What I find indescribably wonderful. And finally we arrive at an important time, the time of the men in fashion. Where men’s fashion is as important as female.